Having something on your blog go viral should be awarded with some sort of Boy Scout merit badge. Or maybe teated like music album sales where a governing body awards you a gold, silver, or double platinum plaque. What ever the award, last week I experienced my first viral post. Because I love numbers, I geekly watched, probably too obsessively, where the traffic came from day by day. As stated in the beginning of the post, I only re-purposed the content from the original source. 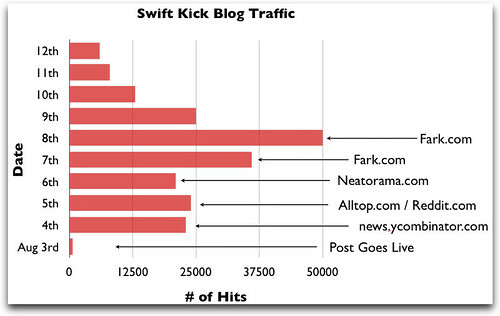 It took me longer to read the original post than it did for me to re-purpose it for Swift Kick. In terms of the content's online life, we were #2, not #1. The funny thing about "going viral" is the amount of LUCK uncontrolled variables involved. Right timing, right readers, right angle of the sun in the afternoon... Some variables can be manipulated and calculated ahead of time. The LOL Cats meme generating empire has created a science out of "going viral." But so much of it seems to be out of one's hands. Based on the topic and strong point of view, I knew this post would do well, but not 160K hits well. It continues to spread around, like a virus, generating hits and 500+ polarizing comments on the state of education in America. The funny thing is I've been on the opposite side of this coin. In May 2009, Kevin sent me this video that was sent to him from a student who asked how it could be described through the ideas in our Dance Floor Theory Leadership Training. I took a crack at it and posted it on Swift Kick. In terms of traffic it did ok, but certainly not viral. Then eight months later, Derek Sivers, gives a TED talk on the same video and BAM, the internet explodes in excitement. Our learning outcomes from the video are pretty close, but he won the viral game even though I posted similar thoughts a year earlier. I highly doubt Derek stumbled on my original post while formulating his TED talk, so how do you determine "original content" on the unruly internet? Can he claim originality because he won the viral game or got to speak at TED? Can I claim originality on the graduation speech because I was the one who won the viral game? Or am I too self absorbed to think anything I write is actually original? Whatever the answer, I'm happy to report the graduation speech just generated 3K more hits! Where's my double platinum plaque?